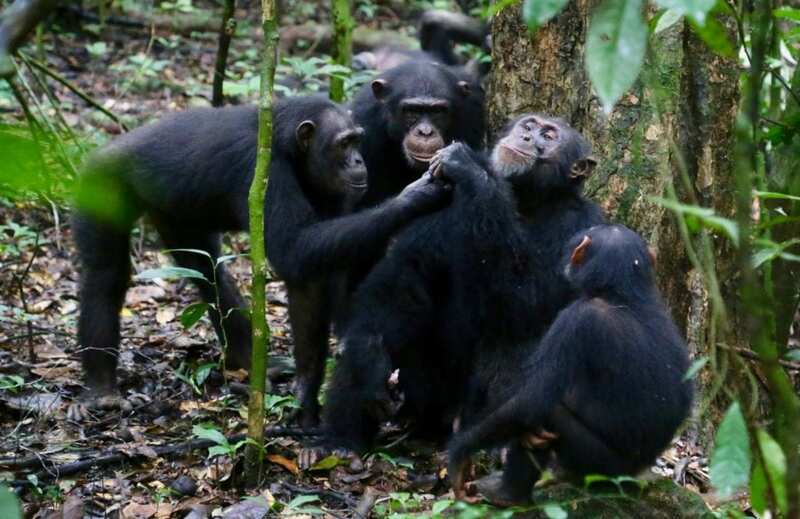 Researchers from the MPI-EVA observed natural food sharing behavior of the chimpanzees of the Tai National Park, Ivory Coast, and found that chimpanzees are very selective in who they share desirable food items, like meat, honey or large fruits, with. They show that chimpanzees were more likely to share food with their friends, and that neither high dominance status nor harassment by beggars influenced their decision. This complements results from another study by the same team published last month that examined meat sharing after group hunting of monkeys. There they found that chimpanzees in possession of meat after successful hunts were likely to reward other hunters by sharing with them. "Collectively our research shows that the chimpanzees decide when to share food based on the likelihood that this favor will be returned in the future", says Liran Samuni, first author of both studies. "Or, in case of sharing after group hunts, sharing of meat is returning the favor for helping out." Previous studies in another subspecies of chimpanzees have suggested that food sharing in chimpanzees mainly occurs because of harassment pressure from beggars. "This was not the case for the Tai chimpanzees", Catherine Crockford, senior author on the studies, points out, "emphasizing the high variation in cooperation across chimpanzee populations." Human populations also vary in how cooperative they are and research is ongoing in both humans and non-human animals assessing what might make some populations more cooperative than others. "The need to stay in a cohesive unit, because of high predation pressure, or the capability to exhibit strong cohesion, because of rich food sources, are two possible scenarios to promote the expression of cooperative acts", suggests Roman Wittig, the second senior author of the studies. Additionally, the researchers collected urine samples from chimpanzees after hunting and food sharing events and measured the hormone oxytocin. "We know that oxytocin plays a strong role in lactation, which you could look at as an example of food sharing between mother and infant, and is generally involved in social behavior and bonding", Liran Samuni explains. The researchers found high levels of oxytocin after chimpanzees shared meat and other valued foods, and after chimpanzee participated in hunting with others. "That we found higher oxytocin levels after both hunting and sharing adds to the idea that oxytocin is a key hormone involved in cooperation in general", Liran Samuni points out. The researchers conclude that like humans, Tai chimpanzee sharing is selective, and that friends and others that helped acquiring the food benefit more. Emotional connection, as is obvious amongst friends, likely played a crucial role in the evolution of human cooperation.